Due to the waste of companies and individuals, the accumulation of garbage and the extinction of flora and fauna, among other causes, the planet suffers from environmental pollution. Fortunately, there are more and more people who are aware of the environment and who perform small acts that can be of great help to the Earth, such as recycling cardboard, aluminum, glass or plastic. This last material deserves a mention separately, since it is one of the most used of the planet. And while we have the possibility of releasing the plastic containers to the specific containers for this purpose, we can also give them a second life by turning them into useful items for the home. It is important to keep in mind that plastic is a material easily moldable and quite resistant, so it can serve to create all kinds of things. 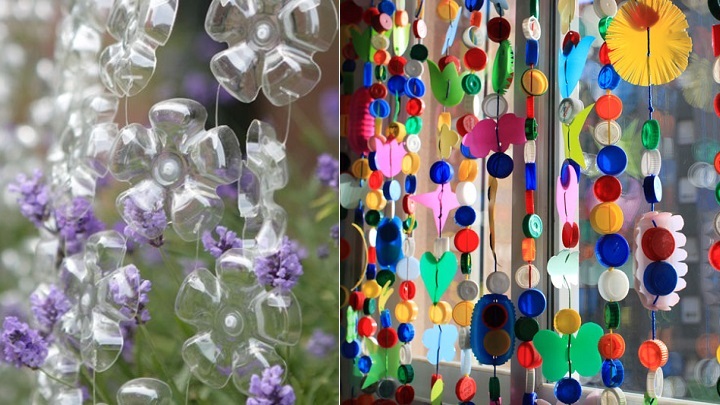 To prove it, today we are going to give you 10 good ideas to recycle plastic bottles. Most of them are very easy to perform, but others require skill and patience. In any case, it’s worth checking them out. Would you like to join us? Many of the disposable items we have at home can serve as pots. Among them are the plastic bottles that, cutting them in half, can become beautiful flower boxes. Of course, you can paint and / or decorate them to make the result more attractive. 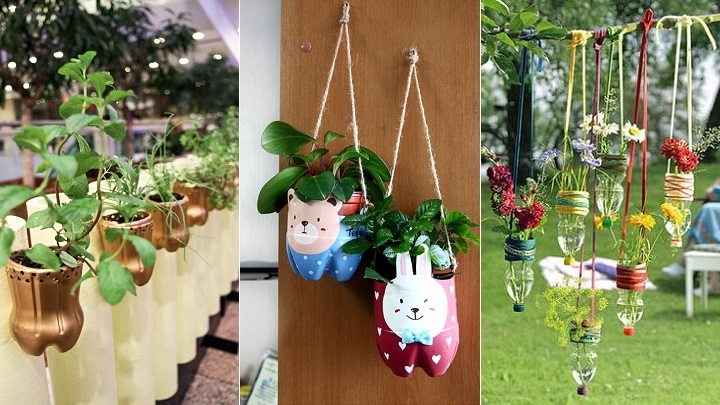 In addition, it is a great idea to use the bottles to create hanging pots. 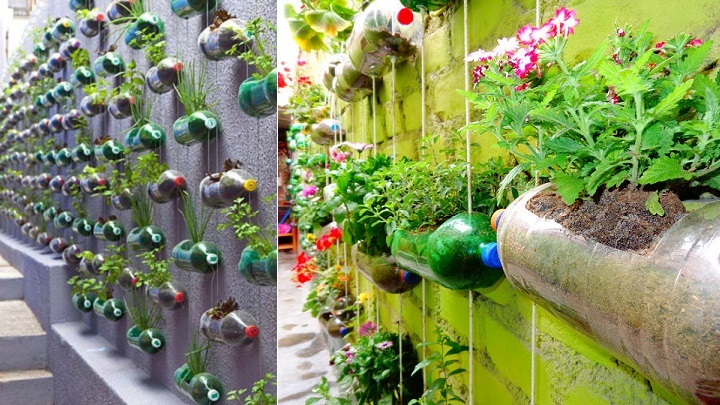 If you accumulate many plastic bottles, you can create a beautiful vertical garden. In this case, you will not have to cut them in half, but you should make a hole in the middle and fill them with dirt, as you can see in the photos. If you have kids at home, you surely have lots of crayons. Well, there is a way to organize them by contributing to the maintenance of the environment. 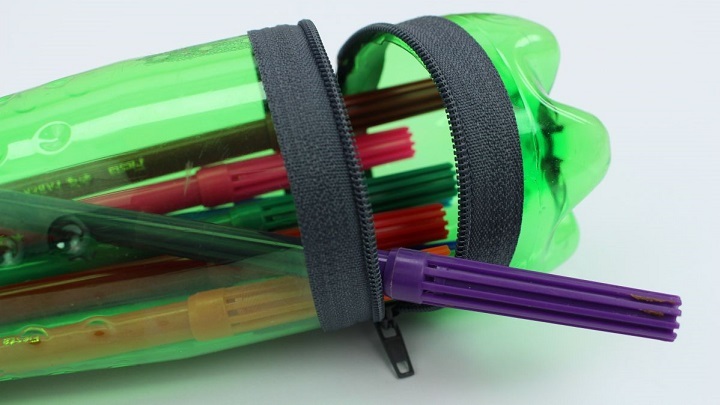 It is about turning plastic bottles into beautiful pens. As you can see in the image on the right, you can even use the pots of champuses. 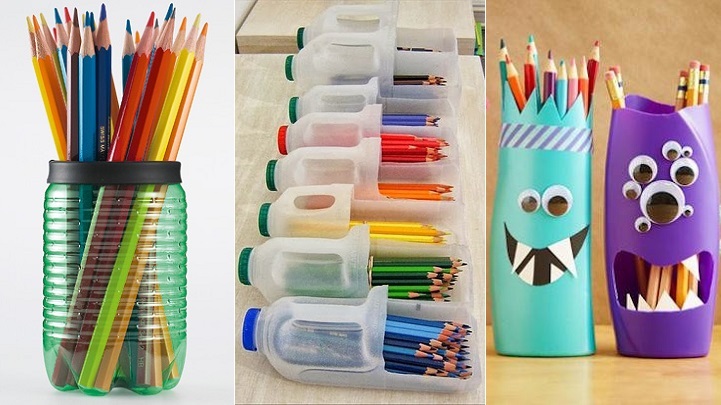 Another interesting idea is to create cases using the bottles. To do this, you must install a zipper. Surely the little ones in the house love to bring a very original case to school. Do you have a terrace or garden and want the birds to come to him? Then you should put a trough. Of course, you do not need to spend a euro, since you can make it with a plastic bottle. You can even create an original booth. 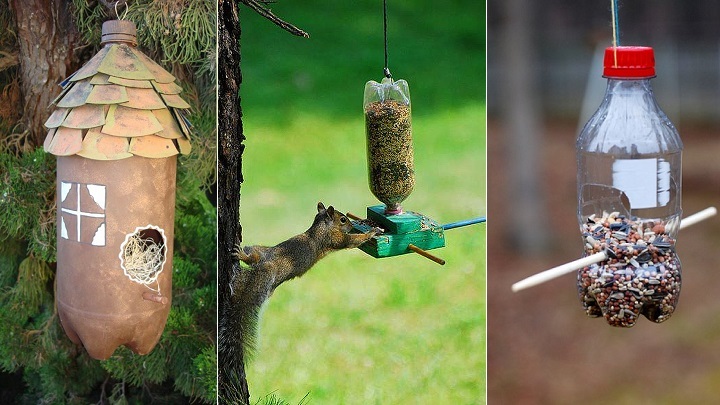 Even the squirrels will approach. 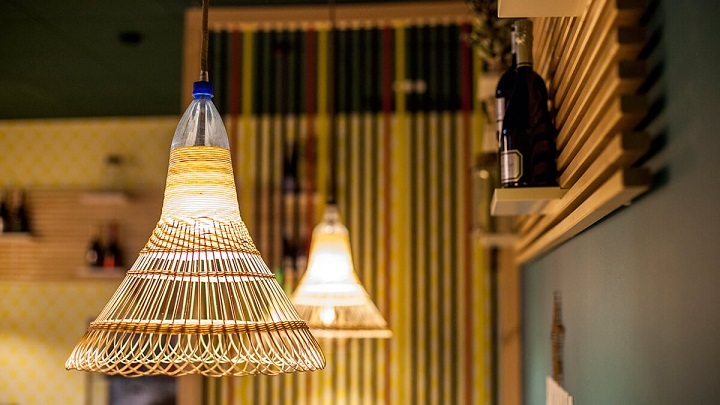 Another interesting option is to use plastic bottles to create lamps. There are many ways of doing them and some of them are very elaborate. One of the ones that we liked the most is the one that we show you in the image. 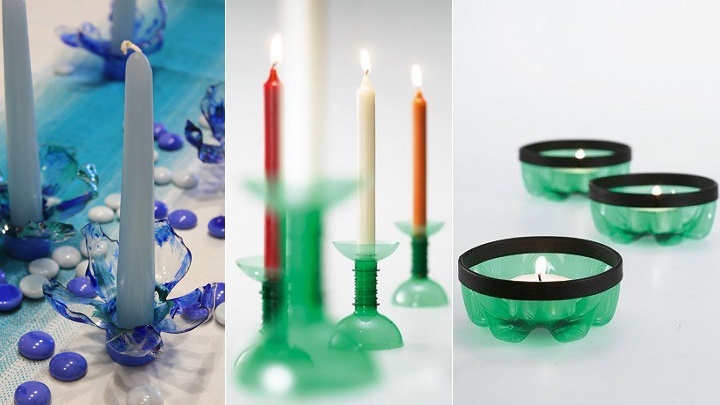 As you can see in the photos, plastic bottles can also have a second life in the form of candle holders or candlesticks. In this case, you can opt for simple designs, like the one on the right, or for more elaborate ones, like the one on the left. With the bottom of the bottles you can create nice curtains. In addition, you can also take advantage of the bottle cap. In fact, you can create a nice curtain if you mix plugs of different colors and sizes. 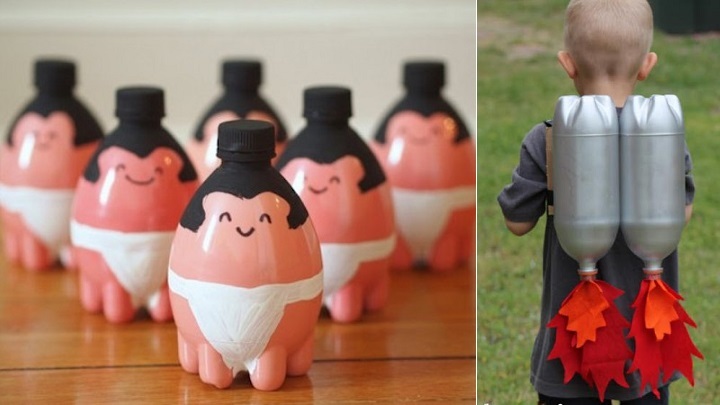 Plastic bottles can also be used to make toys for the little ones in the house. In the images, you can see two examples: a rocket and small sumo wrestlers that can be used as bowling. 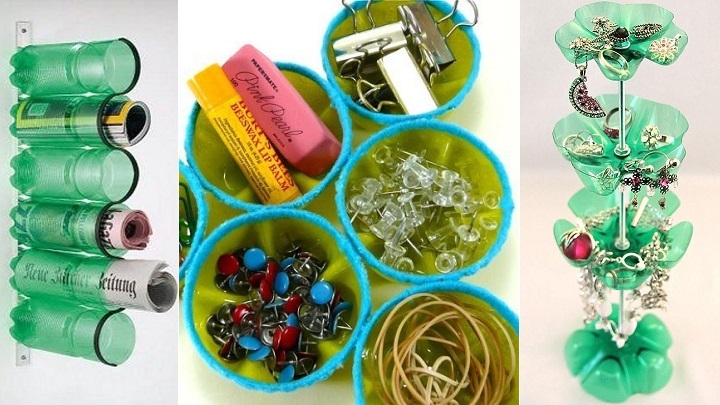 Finally, we want to comment that plastic bottles can also be used to organize different objects. Before we talked about the pens, but you can also create jewelers or magazine, among other elements.